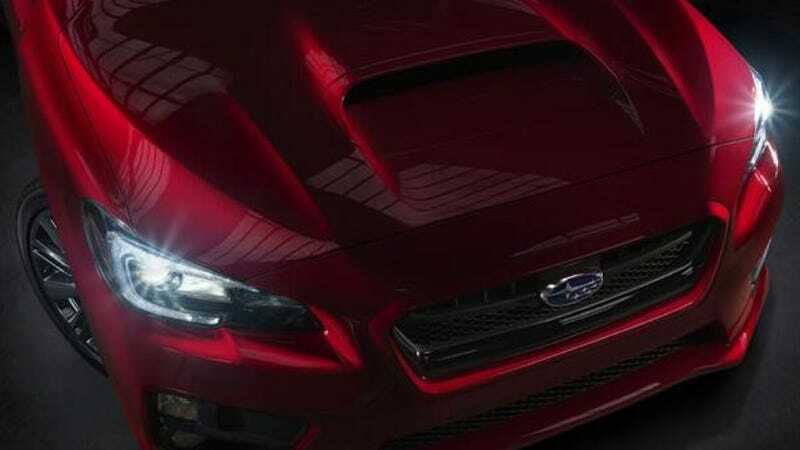 Subaru has been teasing their new WRX rally weapon/hoonmobile for a while now. But the wait is nearly over, we'll see the whole car next week at the LA Auto Show. But for now, here's a hoodscoop. Now, there's only so much you can discern from a teaser shot. Here we have a hoodscoop, headlights, and a grille. It's also obviously based on the latest Impreza, which is a good thing since the last WRX was, how do you say, facially challenged. The Elephant Man of the all-wheel drive Japanese sedan world. So what else do we expect? Well, Subaru says they've never built anything like this before. But I'm willing to bet that's marketing speak and it'll be an all-wheel drive turbo boxer four with a manual trans. And probably a double clutch too because one clutch is for losers. We'll let you know the skinny next week.